MTC Note: The snow line is climbing in Western Montana and our choice of runnable trails increases almost daily. Spring is a time when trail runners can't help but get excited about summer long runs in the mountains and all the magnificent trails still buried under a hundred inches of snow. To do our part to fuel this preseason excitement we'll be featuring a number of bare bones route descriptions in the coming weeks detailing some of our favorite Montana trail running routes. These descriptions will then be archived under our trail guides tab. Do you have a route you'd like to share? Let us know about it (admin@montanatrailcrew.com) and we'll put something together. The Lake Creek and Wrangle Creek trails in the Rattlesnake National Recreation Area and Wilderness provide two options for what may be the Rattlesnake’s most spectacular loop run (29 and 32 miles respectively). The routes start at the main Rattlesnake trailhead, either ascending Stuart Peak in the clockwise direction or climbing up past Franklin Bridge in the counterclockwise variation and splitting off at the forks of Rattlesnake Creek and the Wilderness boundary 14.5 miles into the run. The Lake Creek Route is about three miles shorter than the Wrangle Creek route, but features a grueling climb right at the forks through a prominent notch in the cliffs above. It eventually leads into a basin with numerous stream crossings, passing an old prospector’s cabin and skirting a handful of lakes along the way. A final climb leads up out of the basin to the ridge leading toward Stuart Peak and the familiar descent. Back at the forks above Franklin Bridge, the Wrangle Creek loop takes the northern drainage and also passes a couple alpine lakes, including the spectacular Glacier Lake (see video clip below), which for much of the year features a snow couloir off of Mosquito Mountain leading all the way down to the water’s edge. The trail switchbacks up out of the basin cirque to gain the Stuart Peak trail (517). The advantage of the Wrangle route is not only the extra mileage, but the opportunity to diverge briefly from the trail to summit Mosquito Mountain (8,018’) and enjoy its prominence and the expansive view of the Wilderness and mountain ranges beyond. Descending Mosquito’s southern ridges leads back to the trail and to the Lake Creek trail junction and that 4000-foot descent over 8 miles back to the trailhead. Whichever variation of the loop you choose, Rattlesnake Creek is there to meet you at the end of your run for a post-run ice bath! 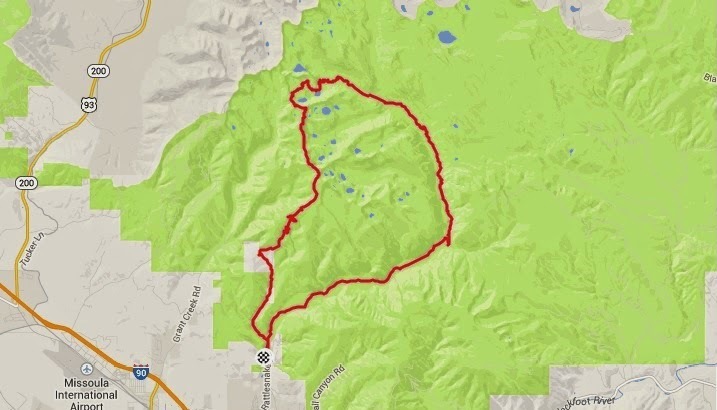 Some Strava data from the Wrangle Creek Loop. Lots of lakes, lots of mountains. Elevation profile for the Wrangle Creek Loop, clockwise. The high point is Mosquito Mountain.